Due to overwhelming demand, the road to THE END just got longer. On the heels of their much-anticipated performances in North America, Australia, New Zealand and Europe, BLACK SABBATH will end the epic journey they began nearly five decades ago with another run of North American dates in fall 2016. These shows will follow a mix of summer headlining and festival performances throughout Europe. The second run of North American dates kicks off August 17 at Jones Beach Amphitheater in New York and includes stops at the Hollywood Bowl in Los Angeles (where the band last performed a sold-out show on their wildly successful 13 World Tour in 2014), Chicago, Philadelphia, Toronto, Detroit, and Dallas, among others, before wrapping September 21 at AK-Chin Pavilion in Phoenix, AZ. 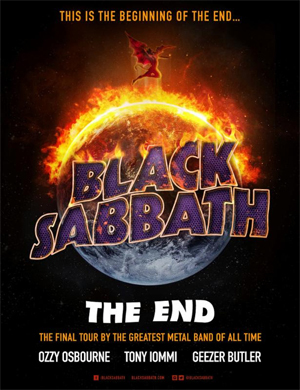 The massive 2016 World Tour by the greatest Metal Band of all time marks THE END for Ozzy Osbourne, Tony Iommi and Geezer Butler as they close the final chapter in the final volume of the incredible BLACK SABBATH story with this tour. BLACK SABBATH's THE END farewell tour promises to surpass all previous tours and will feature the band's most mesmerizing production ever. Watch the updated video announcement below.